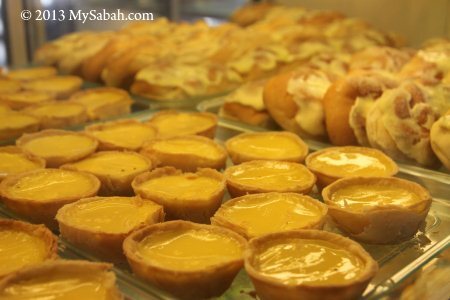 You can find UFO Tart easily in Sandakan. Many coffee shops, even night market, sell UFO. I hope UFO will land in Kota Kinabalu city soon. 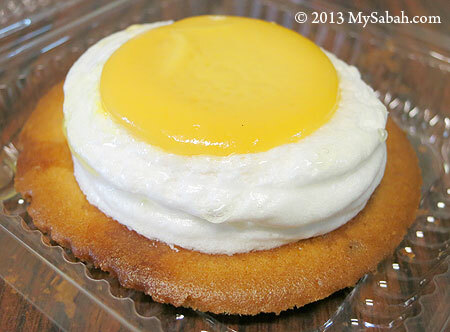 UFO Tart has a soft and vanilla-flavored cake base topped with sweet creamy custard. You can have the whole tart in one bite. 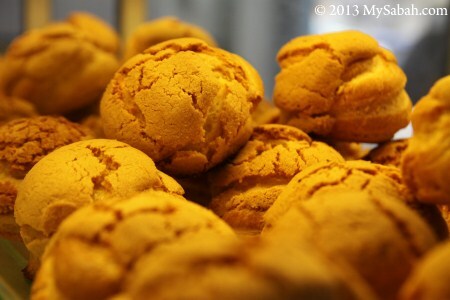 For me, it tastes like butter-rich cookie with rich aroma of egg and vanilla. 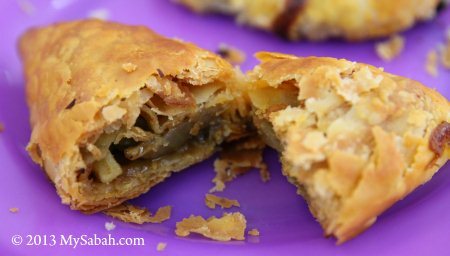 UFO Tart goes very well with a cup of hot coffee. 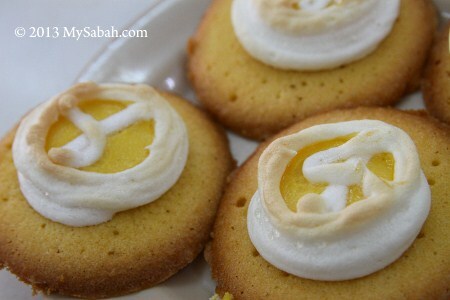 UFO tart costs about RM1.50 (≈USD0.50) each. 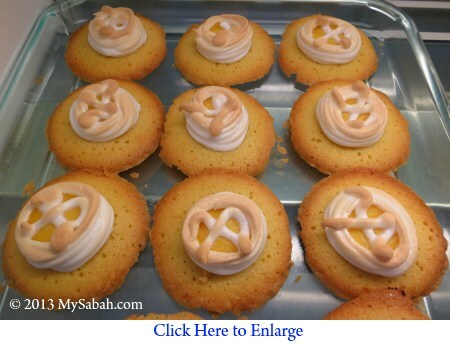 It is not cheap because it takes many tedious steps to create this delicacy. The born of UFO Tart is simply an accident over 50 years ago. 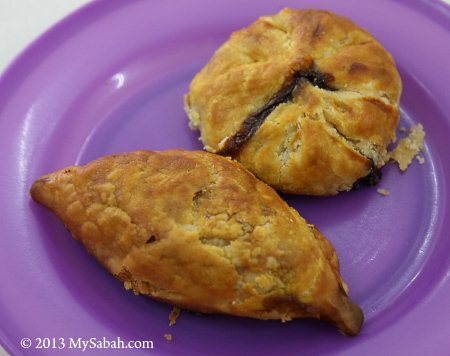 In 1955, a Hainanese cake baker named Fu Ah On (符和安) was making tarts as usual one day. While busy mingling, he overbaked his tarts. Surprisingly, the burnt tarts tasted good. 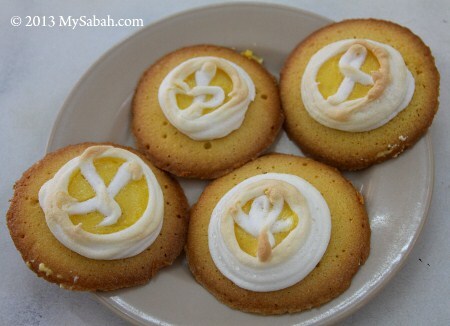 Then he introduced this new tart and people loved it hence it became a traditional cake unique to Sandakan until today. 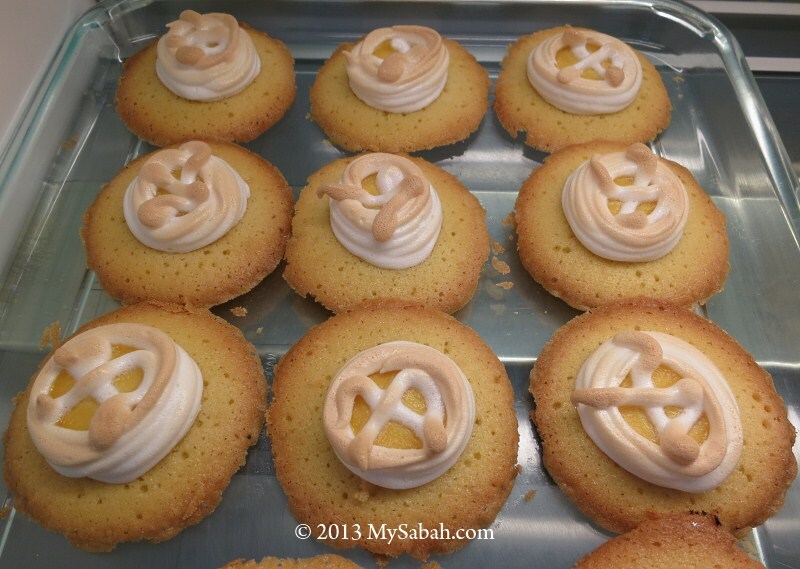 Below is another UFO tart I saw in other coffee shop. 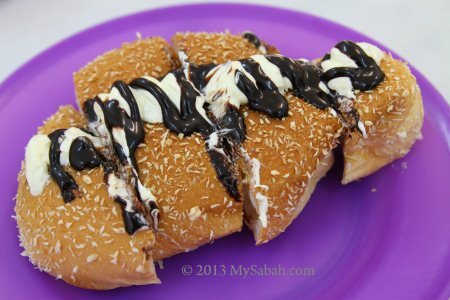 There are many Sandakan restaurants where you can enjoy UFO tart. 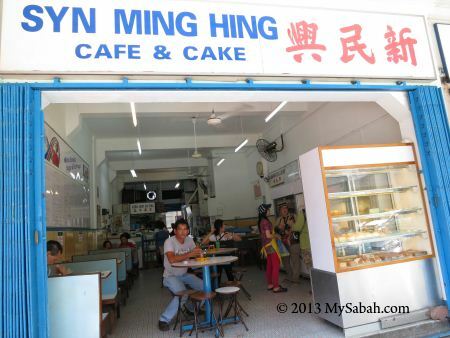 The local recommended Syn Ming Hing Cafe & Cake (新民兴) to me. 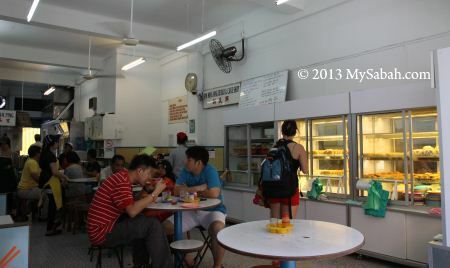 Though it’s a Chinese restaurants, many Malay and Muslim come here for breads and noodles too. 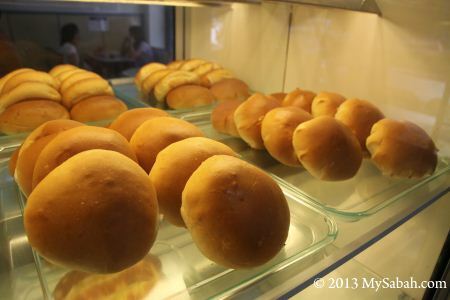 Syn Ming Hing is a great place for tea time, due to its rich variety of fresh breads and buns. 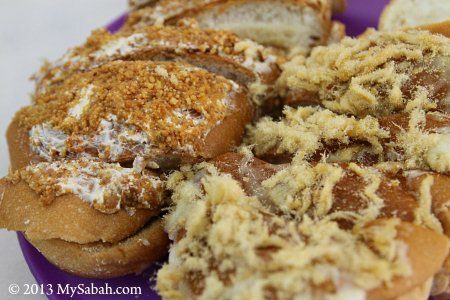 Oh boy, the following photos will make you mouth-watering.. Too bad, you only can “eat” them with your eyes here. Timing is the most important for breads, pastries and buns. 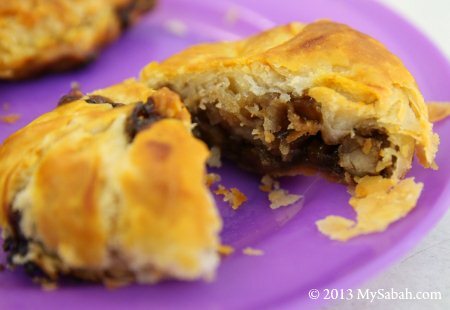 They taste the best when they are still hot and come out fresh from oven. 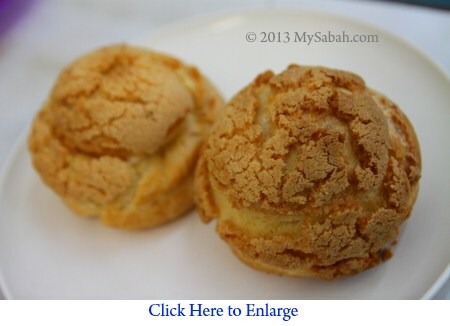 Besides UFO tart, another best selling item of Syn Ming Hing is Cream Puff. 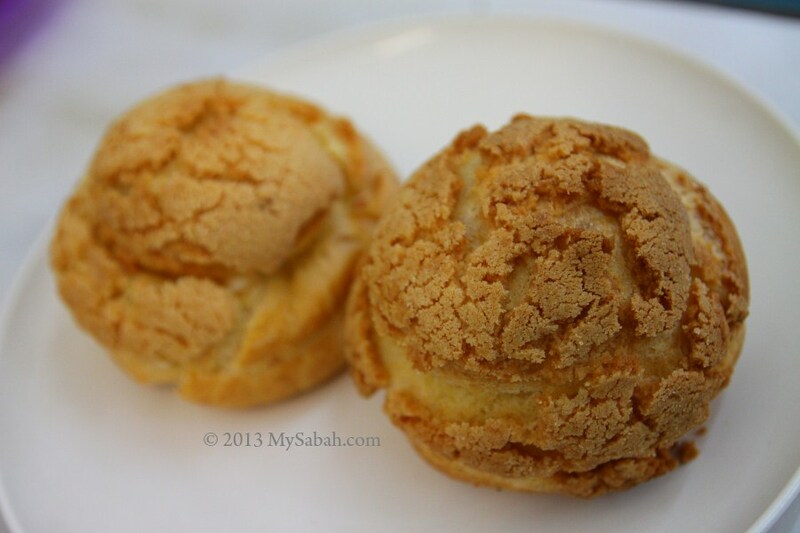 Cream Puff has sugarly crunchy outer layer but sweet, soft and creamy inside. 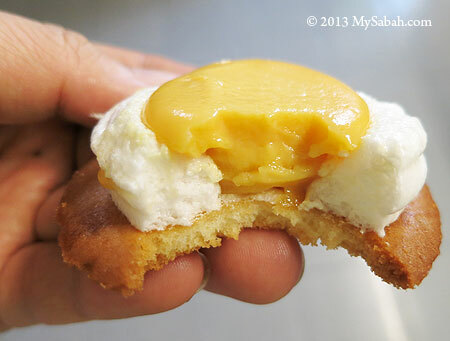 Pic: look at the overflow cream! 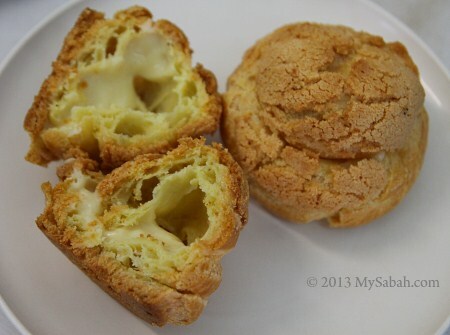 Though I’m not a bread & pastry lover, I really miss UFO Tart and Cream Puff. 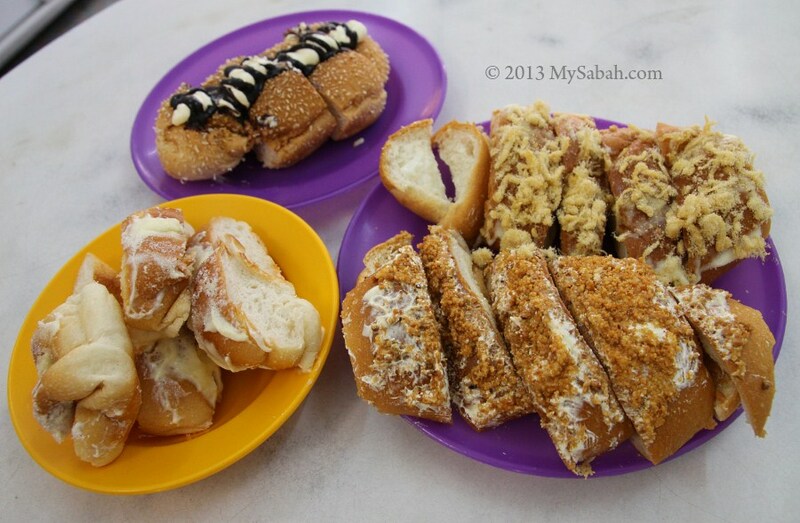 Whenever I go to Sandakan, I’ll order them. It is already nice just by looking for them. 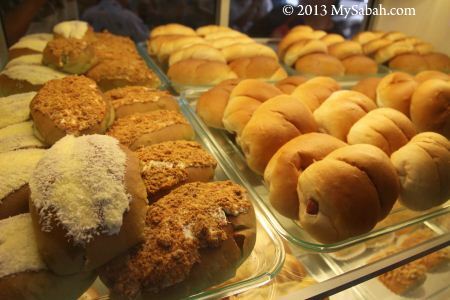 Their breads have many styles and flavors such as butter milk, red bean, chocolate, coconut and peanut. 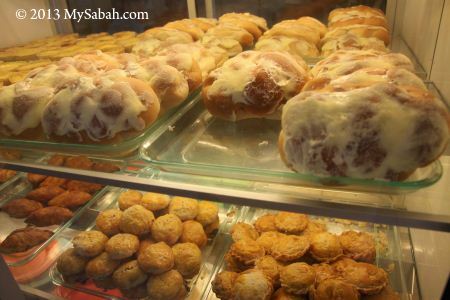 Syn Ming Hing Cafe & Cake is located at Jalan Dua of Sandakan city center (Click Here for location map). The restaurant opens from 7:30am – 5:30pm (Mon – Sat) and 7:30am – 2:00pm (Sun), and they might close on Public Holiday. 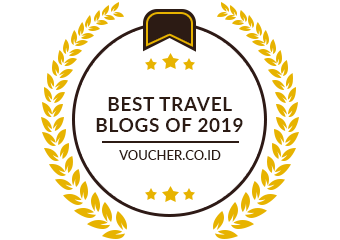 You can call them at +60 89 212779 (Woo Yuk Mei) to confirm. Do you like UFO too? Please recommend other places where you can find excellent UFO Tart.